​Anthony Lark has drawn up a list of names -- Terry Dawtrey, Sutton Bell, Henry Kormoran. To his eyes, the names glow red on the page. They move. They breathe. Dawtrey is in prison; Bell has a wife and daughter and a good job; Kormoran lives alone. They have little in common except that seventeen years ago they were involved in a notorious crime: the robbery of the Great Lakes Bank. Now Anthony Lark is hunting them, and he won't stop until every one of them is dead. David Loogan is living in Ann Arbor with Detective Elizabeth Waishkey and her daughter, Sarah. He's settled into a quiet routine as editor of the mystery magazine Gray Streets -- until one day he finds an envelope outside his office door. The manuscript inside begins with a deadly hook: I killed Henry Kormoran. Soon both David and Elizabeth are drawn into Anthony Lark's violent world. As Elizabeth works to track Lark down and uncover his motives, David befriends Lucy Navarro, a tabloid reporter with a crazy theory about the case -- a theory that threatens to implicate some very powerful people. And when Lucy disappears without a trace, David decides her theory may not be so crazy after all. "In the early days of detective fiction, readers devoured mysteries to find out who-done-it. As the genre matured, why-done-it became just as important, and more mysteries came to read 'like a novel,' growing as complex as mainstream fiction, or life itself. "Consider the ambiguity suggested in the name of the crime-fiction magazine edited by David Loogan, the semi-narrator of Harry Dolan's smooth and appealing second novel, VERY BAD MEN: It's called Gray Streets -- neither noir nor blanc. "Loogan, who figured in Mr. Dolan's well-received debut book, BAD THINGS HAPPEN, gets drawn into this twist-filled adventure via a confessional manuscript left at the door of his Ann Arbor, Mich., office, a 'story' that begins: 'I killed Henry Kormoran in his apartment on Linden Street.' Even as Loogan reads this sentence, his police-detective girlfriend, Elizabeth, is investigating the scene of Kormoran's murder. Soon David and Elizabeth are in parallel pursuit of the latest would-be contributor to Gray Streets. Their inquiries entangle them in the aftermath of a 17-year-old bank robbery and the present-day political campaign of the daughter of that robbery's handicapped and retired hero-cop. "Loogan's first-person narrative sections alternate with third-person chapters detailing the acts and thoughts of the synesthesia-suffering, headache-prone serial-killer who seems to be wreaking most of the book's havoc. ('The ache behind his eyes had begun to twist itself into a hangman's knot.') The characters in this engaging work are full of surprises, but most startling of all is the way an apparent villain becomes a heartbreaking would-be champion. Truth can be stranger than fiction, especially on Mr. Dolan's gray but vivid streets." "It's been about two years since Ann Arbor author Harry Dolan burst on the crime novel scene with his highly acclaimed debut novel BAD THINGS HAPPEN, which introduced David Loogan, editor of Gray Streets, a mystery magazine. 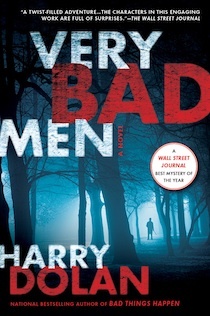 The wait's definitely worthwhile; Dolan's back with a vengeance -- and so is Loogan, in VERY BAD MEN. . . . Dolan is exceptionally good at keeping the pacing going, using strong, well-developed, colorful characters, brisk dialogue and seemingly endless plot twists. It's easily one of the year's best mysteries." "A second mind-bending case for Ann Arbor editor David Loogan that begins just as simply and ominously and takes the reader on just as wild a journey. "Anthony Lark's mission is simple: to kill three of the men involved in a fatally botched bank robbery 17 years ago. He's already dispatched two of his targets -- an impressive feat, considering that one of them, Terry Dawtrey, is serving 30 years in Kinross Prison -- when he identifies them both and announces his third, nurse practitioner Sutton Bell, in an anonymous letter to Loogan (Bad Things Happen, 2009), who promptly shares it with his ladylove, police detective Elizabeth Waishkey. The timely intervention of aspiring tabloid reporter Lucy Navarro saves Bell from Lark's initial attempt and gives Dolan a chance to fill in some back story. Lark's motives are obscure, but they have something to do with U.S. Senate candidate Callie Spencer, whose father Harlan was the Chippewa County Sheriff shot and paralyzed in the bank robbery and whose father-in-law, John Casterbridge, is the senator she hopes to succeed. Lark keeps coming nerve-wrackingly close to killing Bell; Loogan and Elizabeth keep coming heartbreakingly close to catching Lark; and yet the tale still goes on. To divulge any more about the plot would spoil some of the dozens of surprises Dolan springs. But it's not too much to say that nearly every cast member, however minor, is complicit in some crime; that nearly every one, even though they're all rooted in excruciatingly familiar generic types, gets a chance to reveal unexpected depths; and that Dolan mixes his pitches with an ace's judgment, steadily complicating Lark's quest while keeping the psychology of his characters considerably more plausible than in Loogan's equally baroque debut. "The rare crime novel with something for everyone who reads crime fiction." "Dolan follows Bad Things Happen, his acclaimed debut, with a riveting crime novel also featuring Ann Arbor, Mich., amateur sleuth David Loogan, editor of the mystery magazine Gray Streets. When Loogan finds a manuscript outside his office door -- a story about three murders, two already committed and one still being planned -- he instantly realizes it's not a work of fiction but a declaration from the murderer of two local men. With the help of his police detective girlfriend, Elizabeth Waishkey, Loogan uncovers an elaborate, at times convoluted conspiracy including criminals involved in a 17-year-old bank robbery gone wrong, an adulterous statesman, a paranormal fantasy novelist turned tabloid journalist, and a charismatic politician running for the Senate. As the body count rises, the intrepid Loogan gets closer to the truth -- and closer to becoming the killer's next victim. Relentless pacing, a wry sense of humor, and an engaging protagonist add up to another winner for Dolan." "Harry Dolan? Stephen King's reaction to his 2009 debut Bad Things Happen offers food for thought: 'Great f***ing book, man. I was totally hooked.' You'll be completely snared come July 7 when the second novel starring mystery magazine editor David Loogan hits the streets. With down-to-earth language (adverbs, or lack of them, play a key role here), realistic dialogue, quirky but human characters and an off-kilter plot that brings to mind a Coen Brothers film (there's even a good role for Frances McDormand), VERY BAD MEN is the mystery of the summer -- totally top-shelf. Unless you're clairvoyant, you will be blindsided at least four times in this slowly unraveling story of an oddly normal, single-minded killer (think a sweeter version of Anton Chigurh from 'No Country for Old Men') out to erase the participants in a 2-decades-old bank robbery in Sault Ste. Marie, upper Michigan, that may involve the current female candidate for the U.S. Senate. Originality is the Ann Arbor-based Dolan's strong suit; VERY BAD MEN (who these men are keeps changing) is ingeniously stitched together. But there's a lot more to love here, from a beautiful, off-the-beaten track setting to a laconic, Everyman main character whose strong sense of right and wrong can lead to accidental gunshot wounds. Simply great storytelling, man." "Like Dolan's notable debut, BAD THINGS HAPPEN, this cleverly plotted hard-boiled tale features mystery magazine editor David Loogan, and revolves around a mysterious manuscript -- a narrative of murders committed and ones yet to be. . . . Dolan's knack for layering his narrative with nods to the genre's form and allusions to other mysteries and manuscripts adds to the reader's pleasure." "Harry Dolan knows how to write a book that grabs you." "Dolan makes sure that both the characters and dialogue stay rough around the edges, just like the scenery of northern Michigan, giving VERY BAD MEN a satisfyingly realist bite." 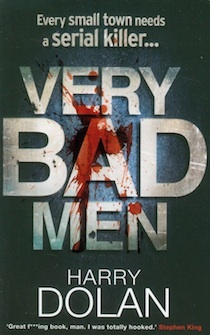 "In VERY BAD MEN, Dolan has written a stylish thriller where things are never quite what they might appear to be." > Listen to the interview here. "Turn the pages as fast as you can, and you still won't keep up with the furious pace Harry Dolan has set in this chilling thriller. It's a rollercoaster ride from start to finish." "Fast-paced and intelligent . . . Complex and well-developed characters, a mind-bending plot and a wry tone make this novel impossible to put down."